About 11 to 14 inches tall. "They exceeded my expectations and that is not easy to do. They are incredibly well made -– surprisingly so. I purchased them for two of my sons and they are not 'gentle' boys so I am pleased they are so well made." "I am as satisfied as I can be. I had some of the most responsive and excellent customer service from CurlyQ Cuties as I have ever had from any company, and I appreciate it more than I can tell you. For that reason alone I would strongly recommend your company." "Love it! Thanks for letting the monster travel to Germany. A picture of Jasper and his spotted friend will follow." "I am very happy with my purchase!! I would recommend your site and I hope to use you again. I like that my child and I got a chance to design our little guy and so I knew it made him completely comfortable, nothing scary, and it was so very personalized. ... Thank you for making my son smile." "These are the cutest tooth fairy pillows I found anywhere." 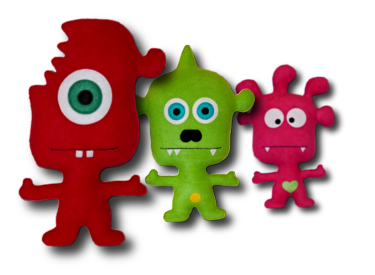 "I have always loved the 'not so scary monsters' and I have collected ALL of the Uglydolls. When I first came to the site I played with it for about an hour. I ordered 3 my first order and when I received them I almost cried! They are better quality than Uglydolls, and best of all, I designed it. I put the shipping box to the side and immediately got on the site and made 3 more!! I love them!!"